Reading ( /ˈrɛdɪŋ/ RED-ing) is a city in southeastern Pennsylvania, United States, and the seat of Berks County. It is the principal city of the Greater Reading Area. Reading had a population of 88,082 as of the 2010 census, making it the fifth most populated city in the state – after Philadelphia, Pittsburgh, Allentown and Erie – and the fifth most-populous municipality. According to the 2010 census, Reading has the highest share of citizens living in poverty in the nation. The city lent its name to the now-defunct Reading Railroad, which transported anthracite coal from the Pennsylvania Coal Region to the eastern United States via the Port of Philadelphia. Reading Railroad is one of the four railroad properties in the classic United States version of the Monopoly board game. Reading was one of the first localities where outlet shopping became a tourist industry. It has been known as "The Pretzel City" because of numerous local pretzel bakeries. Currently, Bachman, Dieffenbach, and Unique Pretzel bakeries call the Reading area home. In 1743, Richard and Thomas Penn (sons of William Penn) mapped out the town of Reading with Conrad Weiser. Taking its name from Reading, Berkshire, England, the town was established in 1748. 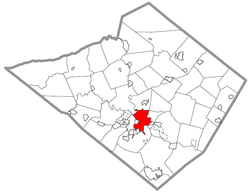 Upon the creation of Berks County in 1752, Reading became the county seat. The region was settled by emigrants from southern and western Germany who bought land from the Penns. The first Amish community in the New World was established in Greater Reading, Berks County. The Pennsylvanian German dialect was spoken in the area well into the 1950s and later. Susanna Cox was tried and convicted for infanticide in Reading in 1809. Her case attracted tremendous sympathy; 20,000 viewers came to view her hanging, swamping the 3,000 inhabitants. As a result of her trial, laws were changed, and she was the last woman executed in the state of Pennsylvania. The Schuylkill Canal, a north-south canal completed in 1825, paralleled the Schuylkill River and connected Reading with Philadelphia and the Delaware River. The Union Canal, an east-west canal completed in 1828, connected the Schuylkill and Susquehanna Rivers, and ran from Reading to Harrisburg, Pennsylvania. Railroads forced the abandonment of the canals by the 1880s. The Philadelphia and Reading Railroad (P&R) was incorporated in 1833. During the Long Depression following the Panic of 1873, a statewide railroad strike in 1877 over delayed wages led to a violent protest and clash with the National Guard in which six Reading men were killed. After over a century of prosperity, the Reading Company was forced to file for bankruptcy protection in 1971. The bankruptcy was a result of dwindling coal shipping revenues and strict government regulations that denied railroads the ability to set competitive prices, required high taxes, and forced the railroads to continue to operate money-losing passenger service lines. On April 1, 1976, the Reading Company sold its current railroad interests to the newly formed Consolidated Railroad Corporation (Conrail). In 1972, Hurricane Agnes caused extensive flooding in the city, not the last time the lower precincts of Reading were inundated by the Schuylkill River as a similar, though not as devastating, flood occurred during June 2006. The 2000 census showed that Reading's population decline had ceased. This was attributed to an influx of Hispanic residents from New York, as well as from the extension of suburban sprawl from Philadelphia's northwest suburbs. Reading has its share of obstacles to overcome, namely crime. However, new crime fighting strategies appear to be having an impact, as in 2006 the city dropped in the rankings of dangerous cities, and then again in 2007. In December 2007, NBC's Today show featured Reading as one of the top four "Up and Coming Neighborhoods" in the United States as showing potential for a real estate boom. The interviewee Barbara Corcoran chose the city by looking for areas of big change, renovations, cleanups of parks, waterfronts, and warehouses. Corcoran also noted Reading's proximity to Philadelphia, New York, and other cities. The financial crisis of 2008 and subsequent nationwide recession stifled optimism; in November 2011 the PBS Newshour reported that Reading was officially the poorest city in the nation with 49% of inhabitants living below the poverty line. The climate in and around Reading is variable but relatively mild. The Reading area is considered a humid subtropical climate, with areas just to the north designated as a humid continental climate. Summers are warm and humid with average July highs around 85 °F. Extended periods of heat and high humidity do occur. On average, there are 15–20 days per year where the temperature exceeds 90 °F. Reading becomes more mild in the autumn as the heat and humidity of summer relent to lower humidity and temperatures. The first killing frost generally occurs in mid to late October. Winters bring freezing temperatures, but usually move above freezing during the day's warmest point. The average January high is 37; the average January low is 20 °F, but it is not unusual for winter temperatures to be much lower or higher than the averages. The all-time record low (not including wind chill) was −21 °F during a widespread cold wave in January 1994. Snow is common in some winters, but the harsher winter conditions experienced to the north and west are not typical of Greater Reading. Annual snowfall is variable, but averages around 32 inches. Spring temperatures vary widely between freezing temperatures and the 80s or even 90s later in Spring. The last killing frost usually is in later April, but freezing temperatures have occurred in May. Total precipitation for the entire year is around 45 inches (112 cm). Reading is located at 40°20′30″N 75°55′35″W﻿ / ﻿40.34167, -75.92639 (40.341692, -75.926301) in southeastern Pennsylvania, roughly 65 miles (105 km) northwest of Philadelphia. According to the United States Census Bureau, the city has a total area of 10.1 square miles (26 km2). 9.8 square miles (25 km2) of it is land and 0.2 square miles (0.52 km2) of it (2.39%) is water. The total area is 2.39% water. The city is largely bounded on the west by the Schuylkill River, on the east by Mount Penn, and on the south by Neversink Mountain. The Reading Prong, the mountain formation stretching north into New Jersey, has come to be associated with naturally-occurring radon gas; however, homes in Reading are not particularly affected. The surrounding county is home to a number of family-owned farms. Companies based in Reading and surrounding communities include Boscov's, Carpenter, Penske Truck Leasing, and Redner's Markets. In 2012, the New York Times called Reading, "the nation's poorest city." Public transit in Reading and its surrounding communities has been provided since 1973 by BARTA, the Berks Area Regional Transportation Authority. BARTA operates a fleet of 57 buses serving 21 routes, mostly originating at the BARTA Transportation Center in Downtown Reading. In addition, Greyhound and Bieber bus routes are available from the InterCity Bus Terminal. The former Reading Railroad Franklin Street Station was refurbished and reopen to bus service on September 9, 2013 with buses running the express route back and forth to Lebanon Transit. Reading and the surrounding area is serviced by the Reading Regional Airport, a general aviation airfield. The three letter airport code for Reading is RDG. Scheduled commercial airline service to Reading ended in 2004, when the last airline, USAir stopped flying into Reading. Reading is a short drive from Harrisburg International Airport, Lehigh Valley International Airport, and Philadelphia International Airport. As of the census of 2010, there were 88,082 people, 29,979 households, and 19,257 families residing in the city. The population density was 8,988.0 persons per square mile (3,467.8/km²). There were 34,208 housing units at an average density of 3,490.6 houses per square mile (1,346.8/km²). The racial makeup of the city was 48.4% White, 13.2% African American, 0.9% Native American, 1.20% Asian, 0.1% Pacific Islander, 30.1% from other races, and 6.1% from two or more races. Hispanic or Latino of any race were 58.2% of the population. 31.97% of Reading residents identified as Puerto Rican in the 2010 Census, the highest percentage Puerto Rican population of any municipality in Pennsylvania. There were 29,979 households out of which 36.4% had children under the age of 18 living with them, 29.8% were married couples living together, 26.3% had a female householder with no husband present, and 35.8% were non-families. 42% of all households were made up of individuals and 21.3% had someone living alone who was 65 years of age or older. The average household size was 2.85 and the average family size was 3.52. In the city the population was spread out with 31.0% under the age of 18, 13.1% from 18 to 24, 26.4% from 25 to 44, 20.3% from 45 to 64, and 9.3% who were 65 years of age or older. The median age was 28.9 years. For every 100 females there were 93.3 males. For every 100 women age 18 and over, there were 88.5 men. As of the census of 2000, the median income for a household in the city was $26,698, and the median income for a family was $31,067. Males had a median income of $28,114 versus $21,993 for females. The per capita income for the city was $13,086. 26.1% of the population and 22.3% of families were below the poverty line. 36.5% of those under the age of 18 and 15.6% of those 65 and older were living below the poverty line. The city of Reading is protected by the 135 firefighters and paramedics of the Reading Fire and EMS Department(RFD). The RFD operates out of 7 fire stations, located throughout the city. The RFD operates a fire apparatus fleet of 5 Engine Companies, 3 Ladder Companies, 1 Rescue Company, 2 Brush Units, and 3 front-line Medic Ambulances. The Fire Department also operates a non-emergency transport BLS ambulance and 3 wheelchair units. In 2012, fire units responded to 7,745 incidents. EMS responses totaled 16,325 calls for service. As of April 1, 2011, Engine's 13 and 14 were disbanded due to budget cuts. Engine 13 was quartered with Engine 1 and Engine 14 was quartered with Engine 5. Also, Engine 7 was re-organized from Engine 11. Department staffing is 2 firefighters per apparatus. The Reading School District provides elementary and middle schools for the city's children. Numerous Catholic parochial schools are also available. It is possible to get a complete education, from kindergarten through college, on 13th Street. Press reports have indicated that in 2012, about eight percent of Reading's residents had a college degree, compared to a national average of 28%. Reading is known for the Reading Fightin Phils, minor league affiliate of the Philadelphia Phillies who play at FirstEnergy Stadium. Notable alumni are Larry Bowa, Ryne Sandberg, Mike Schmidt, Ryan Howard, and Jimmy Rollins. The city has been the residence of numerous professional athletes. Among these native to Reading are Brooklyn Dodgers outfielder Carl Furillo, Baltimore Colts running back Lenny Moore, and Philadelphia 76ers forward Donyell Marshall. The city's cultural institutions include the Reading Symphony Orchestra and its education project the Reading Symphony Youth Orchestra, the GoggleWorks Art Gallery, the Reading Public Museum and the Historical Society of Berks County. Reading is the birthplace of graphic artist Jim Steranko, poet Wallace Stevens, Guitar Virtuoso Richie Kotzen and George Baer Hiester. Marching Band Composer and writer John Philip Sousa, the March King, died in Reading's Abraham Lincoln Hotel in 1932. Keith Haring, NFL quarterbacks Chad Henne, Kerry Collins, wide receiver Steve Kreider and singer Taylor Swift are not from the City of Reading, but surrounding towns in Berks County. Reading is home to the 14 time world champion drum and bugle corps, the Reading Buccaneers. Reading was home to several movie and theater palaces in the early 20th Century. The Astor, Embassy, Loew's Colonial, and Rajah Shrine Theater were grand monuments of architecture and entertainment. Today, after depression, recession, and urban renewal, the Rajah is the only to remain. The Astor Theater was demolished in 1998 to make way for The Sovereign Center. Certain steps were taken to retain mementos of the Astor; Including its ornate Art Deco chandelier and gates. These are on display and in use inside the arena corridors, allowing insight into the ambiance of the former movie house. In 2000, the Rajah was purchased from the Shriners. After a much needed restoration, it was renamed the Sovereign Performing Arts Center. In 1908, a Japanese-style pagoda was built on Mount Penn, where it overlooks the city and is visible from almost everywhere in town. Locally, it is referred to as the "The Pagoda". It is currently the home of a cafè and a gift shop. It remains a popular tourist attraction. Another fixture to Reading's skyline is the William Penn Memorial Fire Tower; one mile from the Pagoda on Skyline Drive. Built in 1939 for fire department and forestry observation, the tower is 120 feet tall, and 950 feet elevation above the intersection of fifth and Penn Streets. From the top of the tower is a 60 mile panoramic view. The Reading Glove and Mitten Manufacturing Company founded in 1899, just outside Reading city limits, in West Reading and Wyomissing boroughs changed its name to Vanity Fair in 1911 and is now the major clothing manufacturer VF Corp. In the early 1970s, the original factories were developed to create the VF Outlet Village, the first outlet mall in the United States. The mall is so successful that it draws hundreds of thousands of tourists to Reading every year. The book and movie Rabbit, Run and the other three novels of the Rabbit series by John Updike were set in fictionalized versions of Reading and nearby Shillington, called Brewer and Olinger respectively. Updike was born in Reading and lived in nearby Shillington until he was thirteen. Filmmakers Gary Adelstein, Costa Mantis, and Jerry Orr's created Reading 1974: Portrait of a City, relying heavily on montage, is a cultural time capsule. Albert Boscov, chairman of Boscov's department store. ^ "Population Estimates". United States Census Bureau. http://www.census.gov/popest/data/cities/totals/2012/SUB-EST2012-3.html. Retrieved 2013-04-02. ^ "Annual Estimates of the Resident Population for Incorporated Places: April 1, 2010 to July 1, 2012". http://www.census.gov/popest/data/cities/totals/2012/SUB-EST2012-3.html. Retrieved 2013-08-28. ^ "Census Shows Reading, Berks growth spurt". http://readingeagle.com/article.aspx?id=293371. Retrieved 2011-03-13. ^ Tavernise, Sabrina (September 26, 2011). "Reading, Pa., Knew It Was Poor. Now It Knows Just How Poor.". The New York Times. http://www.nytimes.com/2011/09/27/us/reading-pa-tops-list-poverty-list-census-shows.html?_r=2&pagewanted=all&. ^ a b "content.aspGreater Reading's destination hub : Greater Reading Convention and Visitors Bureau". Readingberkspa.com. http://www.readingberkspa.com/content.asp?page=funfacts. Retrieved 2013-05-07. ^ Clymer, Floyd. Treasury of Early American Automobiles, 1877-1925 (New York: Bonanza Books, 1950), p.158. ^ Interview with Barbara Corcoran on NBC's Today show. Online. December 2007. Retrieved 27 September 2009. ^ "Climate Statistics for Reading, Pennsylvania". http://www.weather.com/weather/wxclimatology/monthly/graph/USPA1348. Retrieved March 10, 2012. ^ "Top 25 Berks employers in 2010". http://readingeagle.com/article.aspx?id=277950. Retrieved February 18, 2011. ^ Tuesday, June 29, 2010 12:05 am (2010-06-29). "Berks County, Reading unemployment rates rise in May - bctv.org - Local news about Berks County and Reading, Pa.: Special Reports". bctv.org. http://www.bctv.org/special_reports/economy/article_85c144ee-82fe-11df-b95b-001cc4c03286.html. Retrieved 2013-05-07. ^ "Penske Racing - Wikipedia, the free encyclopedia". En.wikipedia.org. http://en.wikipedia.org/wiki/Penske_Racing. Retrieved 2013-05-07. ^ "Penske Truck Leasing - Wikipedia, the free encyclopedia". En.wikipedia.org. http://en.wikipedia.org/wiki/Penske_Truck_Leasing. Retrieved 2013-05-07. ^ a b c Reichler, Joseph L., ed (1979) . The Baseball Encyclopedia (4th edition ed.). New York: Macmillan Publishing. ISBN 0-02-578970-8. ^ "BARRASSO, John A., (1952- )". Biographical Directory of the United States Congress. http://bioguide.congress.gov/scripts/biodisplay.pl?index=b001261. Retrieved November 18, 2012. ^ "David Robidoux". APM Music. http://www.apmmusic.com/r-v/david-robidoux. Retrieved 2013-01-18. Reading Eagle archive, Google News Archive, 1868-2000. —PDFs of 38,630 issues. Henry G. Stetler, The Socialist Movement in Reading, Pennsylvania, 1896-1936. PhD dissertation. Storrs, CT: Henry G. Stetler, 1943. This page uses content from the English language Wikipedia. The original content was at Reading, Pennsylvania. The list of authors can be seen in the page history. As with this Familypedia wiki, the content of Wikipedia is available under the Creative Commons License.